Interview with Alice from Om Baby • The Eco Edit. What inspired you to start Om Baby? I was inspired to start Om Baby after buying a pair of harems for a beach seller in Goa when I was 6 months pregnant. I thought they were super cute at the time and did’t think much else. When Edie was big enough to wear them, at about 3 months when summer kicked in, I realised they not only looked super cute they were also by far the most practical garm I had for her, and the most comfortable. After a quick bit of research I realised traditional style harems are not readily avaliable and that set my mind racing. I’m a print designs and trends editor by profession and I’ve always admired small creative business and I saw this as my chance to do something for me that combined a lot of the things I loved, India, fashion, my daughter and a creative outlet. So when Edie was 7 months I made my first pair and now a year and a half later I’m proud to say there are 100’s of other little Om’s out there around the world and some really happy mammas and pops! Where do your fabrics come from, can you tell us a bit about their provenance? My fabrics are from India, they are printed with the traditional block print method by hand in Rajasthan. I have travelled to India many times and I adore it. I find the creativity and atmosphere magical along with the colours and the people. I’m so in love with their textiles, I buy Indian cotton called Kadhi which is printed with natural dyes. I love the thought that this cloth hasn’t been through lots of machines and touched by chemicals, its simple and honest and tells a story with its imperfections and they way the colours fade with age. I visited Rajasthan in February and selected the prints we have now from two traders. In the future I hope to create my own range of prints along side the more traditional Indian ones, this is going to take time but its my north star. Whats happening at Om Baby HQ right now, and what are your future plans for Om Baby ? Right now I am working through the summer orders, its a busy time for Om. I cut, sew package and post all the orders myself, so in summer, along with enjoying as much family time as I can thats what I’m doing. The near future plans are extending the range up to age 5, I do this for people already who request it especially so I just need to make that standard. From there the request for Om Mama harems are still coming thick and fast so look out for the “mOm” launching next spring! And if i ever get time i would like to start designing some prints and learning more about the natural dye processes. I still work 4 days a week and have a toddler so progress is slow! What are your thoughts on fast fashion and the ethical fashion movement? As someone that has worked in fashion all my working life I understand that fast fashion has its place as for some, its simply unaffordable to buy elsewhere and it also employs a lot of people I know and love. For me, one thing we can do is reduce waste and stop buying too much. One of the reasons I love my Om’s is that they have longevity in their shape, I keep this ethos in everything I design. Om’s last for years not months and have a unisex appeal so can be passed through the family. The aren’t on or off trend, they are simple, classic and timeless. I choose to buy Edie’s ( and my) clothes mainly from charity shops so that I can splash out on the ethical and sustainable brands I adore for treats! I am also impressed by the attempts of some fast fashion brands, namely H&M for their conscious collection which is an affordable option for those that care. Sometimes we just need to think about it, if something costs £5 how much has the person that sew’ed it made? What about the farmer who planted the cotton in the first place? I love Fashion Revolution and their #whomademyclothes campaign that really highlights this, making us think a little more. It is SO hard to be truly sustainable especially for a brand, so its a constant battle on my conscious! 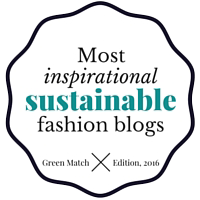 Your must have fave ethical fashion or beauty brands? I love Mini Rodini ! Such fun fashion for kids. Elsewhere I love Ace & Jig, Story MFG, Outerknow & Vejas (you put me on to them via this blog so thank you!) I love a brand with a story and a reason to be – I really buy into that. As for beauty, you can’t beat Aveda, Aesop & Dr Haushka. Lastly, your fave Om Baby piece and print? I love the Om-sie, I couldn’t possibly choose just one print so I’m going with a shape. This photo of your girls in them fills me with pride and joy!